The Government declared 2017 as the year of poverty alleviation and President Maithripala Sirisena has appointed a special committee to work for the eradication of poverty in the country. Sri Lanka is expected to be poverty free by 2020. 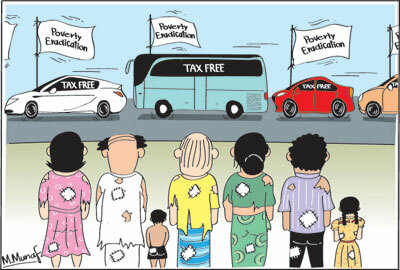 The elimination of poverty has been a popular promise among political leaders in Sri Lanka. Despite their repeated promises, resolutions and committees for eliminating poverty, poverty persists. President Premadasa moved a resolution at the SAARC Summit in Colombo in 1990 to banish poverty in South Asia. Yet nearly three decades later, South Asia has the highest number of the poor despite rapid economic growth. The rhetoric on poverty elimination must be translated into effective economic and social policies that ensure growth with equity. Redistributive income policies and much higher revenue collection are also needed to reduce poverty and income inequality. The rhetoric on poverty elimination has not been adequately backed up by policies that mitigate poverty. Reducing poverty and income inequality remain demanding challenges. President Maithripala Sirisena has vowed to eliminate poverty in two years. This is unrealisable. At most what could be expected is the reduction of poverty to a minimum extent. For this to be achieved rapid economic growth must be achieved by strategies that benefit the poor. The global experience provides useful insights on how poverty and inequality could be reduced. Even though poverty is still a significant feature of many economies the world over, income poverty has been reduced in many countries in recent decades. Economic growth and pro poor economic and social policies have been responsible for this achievement. China’s poverty level of 84 per cent in 1981 was reduced drastically to 18 per cent by 2010. India’s poverty of 60 per cent in 1981 was reduced to 33 per cent in 2010. These reductions in poverty have been achieved mainly by rapid economic growth. Although the decline in poverty has been impressive in India, a third of her population is in poverty. Social and economic structures and the nature of economic growth account for this high incidence of poverty. Poverty continues to decline and is perhaps around one fourth of her population now. Much the same applies to China but her reduction of poverty has been better owing to better education and health and more equitable land tenure conditions. East and South East Asia reduced poverty in tandem with economic growth as they complemented their growth strategy with interventionist economic policies that benefitted the poor. The fast track economic growth provided increasing urban and industrial employment and the government’s fiscal capacity enabled expenditures that benefitted the poor in rural areas. Employment and incomes increased in regions where poverty was high. Latin America decreased poverty and inequality with rapid economic growth and well-designed interventionist policies, increased expenditure especially on higher education, stronger FDI and increase in tax revenues. Strengthening access to quality education was pivotal in Latin America that already has relatively high educational spending but poor outcomes. Raising tax revenues has contributed to declining poverty and inequality as higher revenues provide more space to finance well-targeted redistributive policies. However the region has the most unequal income distribution in the world. These experiences provide useful lessons and policy implications for poverty reduction and for mitigating income inequality. Most important is the need to achieve rapid economic growth that has been the driver for reducing poverty in all countries. The Chinese and Indian experiences, the development experience of East and South East Asia and of Latin America, provide ample evidence of this. What these experiences imply is that economic growth while reducing poverty does not ensure its elimination. The initial conditions of land ownership, education and health and social stratification have an important bearing on the impact of growth on poverty. Interventionist policies that redistribute resources or entitlements have an important impact on the extent of poverty reduction that is achieved. Improvements in literacy and education reduce poverty and inequality of incomes. Improving access of low-income families to education has been an efficient means for boosting equality of opportunity and lowering income inequality. The impact is not confined to the immediate generation but has intergenerational impacts. In fact much of the social and economic improvement in Sri Lanka was due to free primary, secondary and tertiary education. There has been significant social mobility owing to this policy. What was lacking was an improvement in the quality of education, especially at secondary and tertiary levels. Much of the explanation for this failure was the limitation of revenues for such expenditure. Public expenditure on education and health is very important. Therefore government revenues must be adequate to enable the fiscal space for such expenditure. Higher government revenue is essential to poverty alleviation through education. The manner of raising tax revenue is important in reducing poverty and inequality. Progressive income tax systems, including recurrent property taxes, high taxes on luxury expenditure of the affluent, who are notorious for evading taxes, capital gains taxes and death duties would enable better income distribution by reducing incomes of the rich and enabling policy interventions that enhance the entitlements of the poor. Three policy thrusts are needed to reduce poverty. First, economic policies should be conducive for investment and rapid economic growth and the strategy of economic development should be more pro-poor oriented and focused on areas of development, such as in agriculture that would benefit the poor. Reforms in land policies, improvements in rural infrastructure, marketing of agricultural produce are needed. The government has taken some meaningful steps in this direction. But much more requires to be done. Second, there must be much higher expenditure on social infrastructure. Investment in education, health and other welfare measures must be increased substantially. The glaring lack of basic facilities such as water, sanitary conditions and roads that have been revealed by the Gam Udawa program requires an effective government program to provide basic conditions. Third, funds expended on social welfare must be better targeted to reach the deserving. Most welfare measures do not reach the intended beneficiaries. The highly politicised administration of Samurdhi is poorly targeted. Reforming welfare measures to ensure that the poorest obtain relief is vital for alleviating poverty. What is needed is not repetitive rhetoric on the elimination of poverty, nor high level committees, nor fresh studies. What is needed is a clear commitment to pursue policies that improve the entitlements of the poor. Government’s credibility in poverty reduction would be enhanced by curtailment of excessive and wasteful government expenditure like tax free expensive vehicles.